As expected the euro moved towards the downside, printing a decline of nearly 200 pips, and passing the primary confirmation point by over 50 pips. Neither target has been reached just yet, but they weren’t actually expected to be reached this soon anyway. If the main count is indeed correct, then this is only a very early phase in what will be several months of decline. Within black wave (B), blue wave D is unfolding as a double zigzag labeled pink waves w, x and y. Within it, pink wave x formed a double zigzag labeled green waves (w), (x) and (y). Pink wave y is forming a zigzag labeled green waves (a), (b) and (c). 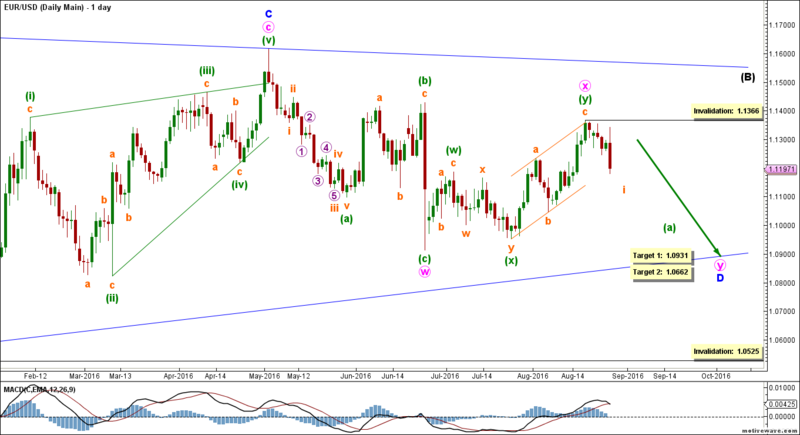 Within it, green wave (a) is forming an impulse labeled orange waves i through v.
This count expects the euro to be moving towards the downside in pink wave y to complete blue wave D. This will be largely confirmed by movement below 1.1234. At 1.0931 pink wave y would reach 61.8% the length of pink wave w, then at 1.0662 it would reach 100% the length of blue wave B. 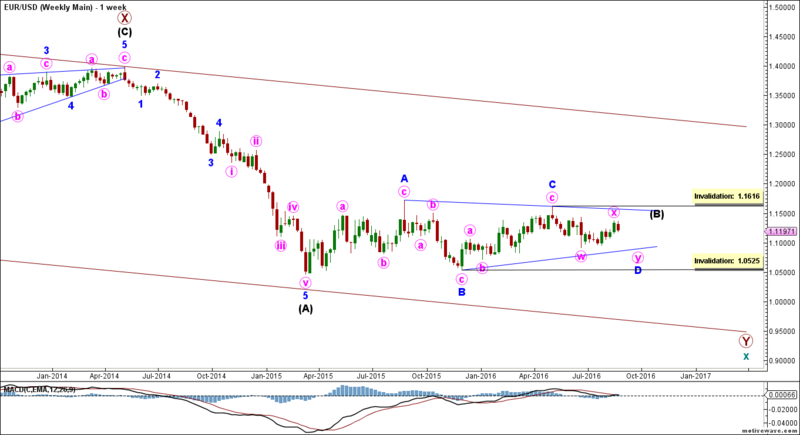 This wave count is invalidated by movement above 1.1366 as orange wave ii may not move beyond the start of orange wave i. It’s also invalidated by movement below 1.0525 as blue wave D of a contracting triangle may not move beyond the start of blue wave C.
This alternate count sees that pink wave x is forming a triple zigzag labeled green waves (w) through (z). Within it, green waves (w), first (x), and (y) are complete, and the second green wave (x) may or may not be complete. 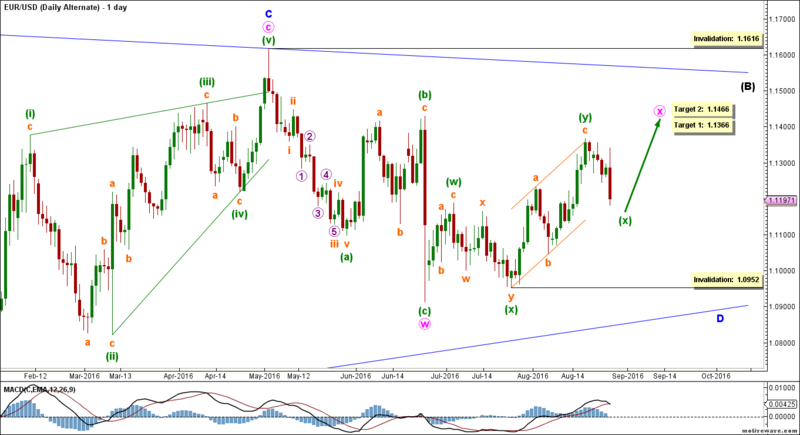 This count expects the euro soon to move towards the upside in green wave (z) to complete pink wave x. This will be confirmed by movement above 1.1366. At 1.1366 green wave (z) would reach the high of green wave (y), then at 1.1466 pink wave x would retrace 78.6% of pink wave w.
This wave count is invalidated by movement above 1.1616 as pink wave x of a double zigzag may not move beyond the start of pink wave w. It’s also invalidated by movement below 1.0952 as it’s virtually unheard of for a second green wave (x) to move beyond the end of the first green wave (x) in a triple zigzag.